This is only some initial material for this section. More material will be developed in alignment with this upgrade. 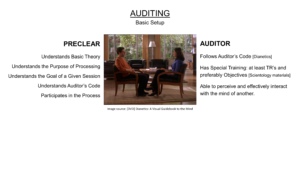 The Auditor’s Code is included in this FILE, and there is a good description of it in this FILE. Note! 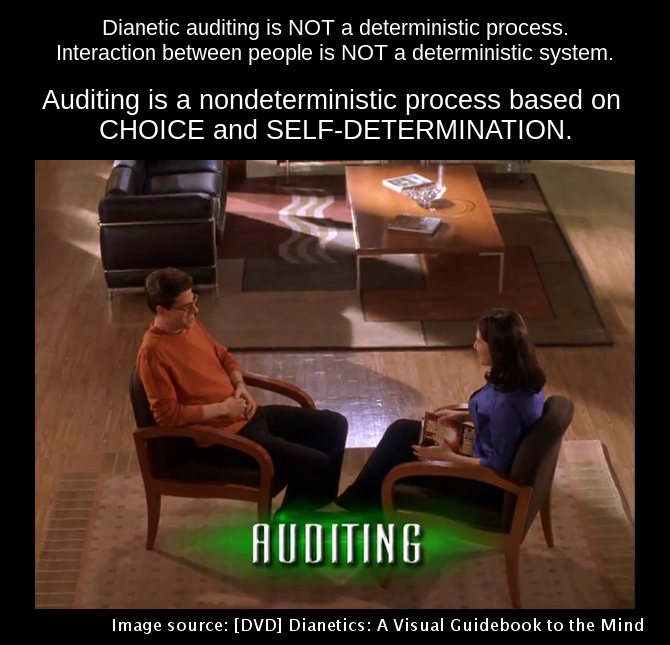 in referencing any of Dianetics and Scientology printed materials, it is FUNDAMENTAL that you use materials produced prior to 1980’s. After the passing of L. Ron Hubbard (the founder of D&S), all of the materials were reedited and populated with subversive alterations so nothing that was published by the Church of Scientology pass mid 1980’s can be trusted with any kind of authenticity. This is a subject of another project – trueLRH.com – and is a complex situation that is currently in the process of being handled. 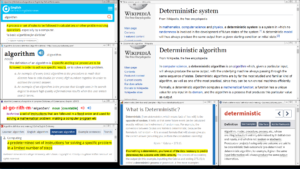 In approaching the practice of auditing, it is important to be familiar with the concept of a deterministic system/process and realize that auditing is a non-deterministic process. 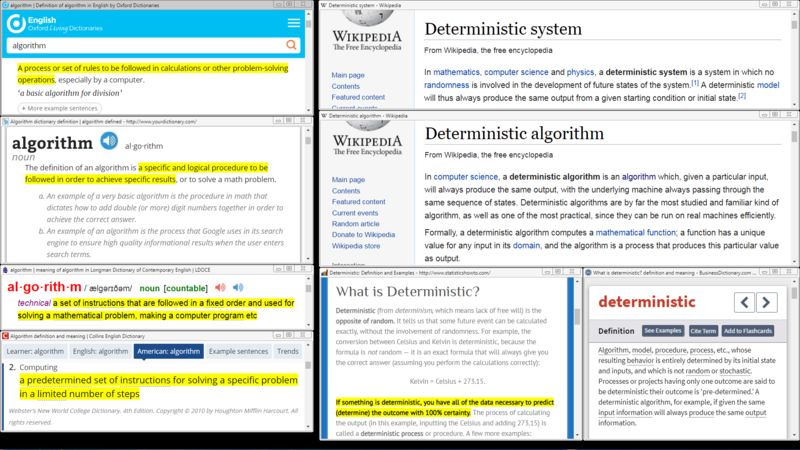 These is a new concept and a new point of differentiation that is a part of this upgrade designed to prevent the practice of auditing from sliding toward “robotism” (unthinking, mechanical activity where people just follow instructions) and the pursuit of some idealized standards with respect to the processes themselves. This is text that was developed in a different area of analysis, now adopted for this section. Both the preclear and the auditor must CHOOSE to participate in the practice of auditing and apply SELF-DETERMINATION continuously throughout the process in order to create a successful auditing session. 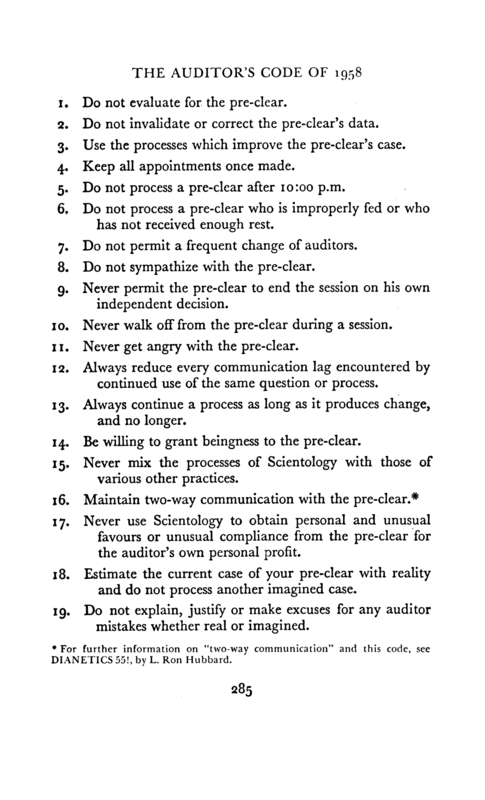 If the preclear chooses NOT to engage with an auditing question or an auditing command delivered by the auditor, then absolutely nothing will occur regardless of how PERFECTLY that auditing question or command is stated. If the auditor assumes a DETERMINISTIC APPROACH towards the preclear and starts to operate on an idea that it is the auditing question or the auditing command in itself that is going to do something to the preclear, then this kind of attitude is going to directly interference with and work against the SELF-DETERMINATION on part of the preclear. Auditing is not meant to do something to the preclear; it is meant to ENABLE or HELP the preclear to have an experience and make one’s own discoveries through that experience. 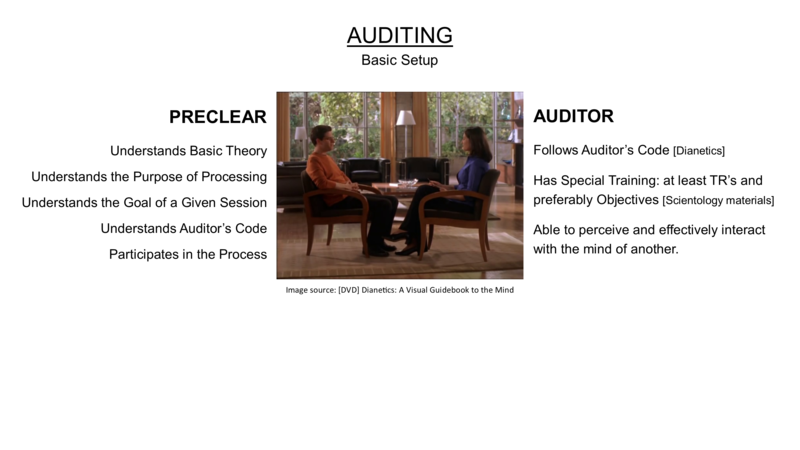 In this way, an auditor serves as a GUIDE to help the PRECLEAR do the work of REACHING higher states of consciousness through the practice of auditing. The same question can be asked repeatedly as long as it continues to trigger a process of discovery in the preclear, each time allowing the preclear to respond and go through the process of any realizations. A question can be varied around a single item to see what triggers. Example: What thought can you not express? Has any thought been blocked? Has any thought been prohibited? What thought is not allowed? etc. The same type of question can be asked with items rotated. Example: What thought can you not express? What emotion can you not express? What statement can you not make? etc. Questions can be asked in a general form. Examples: Has anything been blocked? Is there anything you cannot express? Has anything been stopping you? etc.